In the world of new age home appliances, Samsung is one of the most respected brands in the world. If you are searching for brand new Samsung 200 Liters Refrigerators, then you have come to the right place. Refrigerators with a 200-liter capacity are perfect for small and medium homes that demand an economical and reliable partner to keep foods fresh for extended periods of time. Small refrigerators are usually equipped with single doors and feature direct cool technology. This means you will have to manually defrost the fridge, but the upside is that these refrigerators consume less electricity than the frost free models. 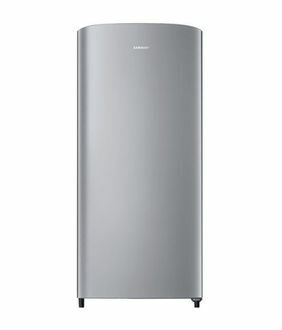 Browse through the price list of 48 Samsung 200 Liters Refrigerators in our product list. This price list is updated on 23rd April 2019. The best part about 200-liter fridges is the cost. They are easier on the pocket so you can save lots of money while still keeping your favourite food items fresh and cool even in the hottest weather. When choosing Samsung 200 Liters Refrigerators, you should pay attention to the star rating. Fridges with a 4-star or 5-star rating will be more energy efficient compared to the 2 or 3-star models. There are lots of colours and designs to choose from the vast list. To easily find the lowest prices on your new Samsung refrigerator, you should take the time to visit the best online shops such as Croma, Amazon, Tata Cliq, Infibeam, and Flipkart. Buying online is the easiest and best way to pay less money for a brand new Samsung refrigerator. This beats going to a store and talking to a salesperson every time.